Today I'm linking up with the lovely ladies from Eat Pray Run DC, You Signed up for What? and Mar on the Run for their Friday Five. The theme of today's link-up is "All About Love" and I'm itching to tell you about five things I'm really, really loving about running right now... Here we go! 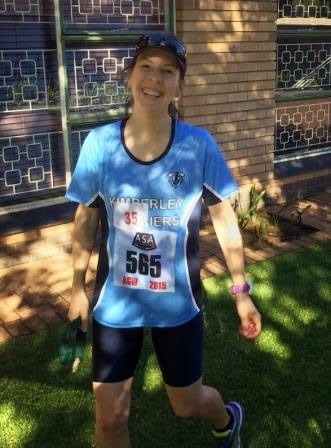 Joining a local running club, the Kimberley Harriers, was the best decision ever. Not only are my new club mates extremely kind and welcoming, but I've also come to love our weekly club time trials. Definitely one of my favourite things about our new town! Don't you just love summertime running? (Apologies to those of you living in the Northern Hemisphere...) There's just nothing like starting off the day with a sunrise run on a cool, quiet morning. Love it. Who am I, right? Perhaps I should be more specific: I really, really love the impact that regular tempo runs (i.e. 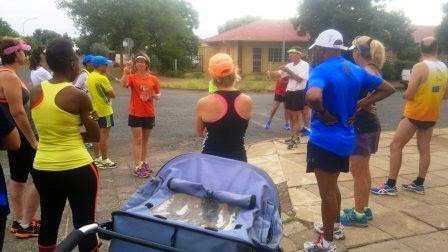 club time trials) are having on my running. I'm gettin' faster, whoooooot! It's blue and it's for running - what's not to love!? Plus I feel all fast and fancy wearing it, ha! My favourite part of the interwebs, by a mile, is the virtual running buddies that it has brought me. I can't even tell you how much I enjoy sharing in the running highs and lows of so many running friends from across the globe. You guys are such an inspiration! Feeling very jealous of your summer right now! We had a windchill of negative 2 here today! (F). It's awful! Wow, that IS awful! I wonder how many South Africans would have run if we had temps like that down here... I'm guessing not many ;) . Wish I could send you some of our heat! I hope you find a really nice running club too, Lisa - and I'm sure you will. It really has made a huge difference for me with settling into a new town. I'm with you, I LOVE tempo runs. I always feel so accomplished after doing them and definitely notice a difference in my long runs! I used to hate them, Sue, until I recently saw what a huge difference they make to my running times. They're hard work, but so worth it! Me too, Darlene - wish I could one day run a race with each one of them! A good running group is fantastic. We don't really have one. The club I belong to is dated and never does anything. I guess I should start my own! Great idea! I belonged to a club like that a few years ago, and it was no fun at all. A good running club is such a huge motivation! so jealous of your summer! that's great that you've found an awesome running club! That is so fun that you have a running club. Virtual running friends are great too! I agree - they're both awesome :) . Love sharing this passion!